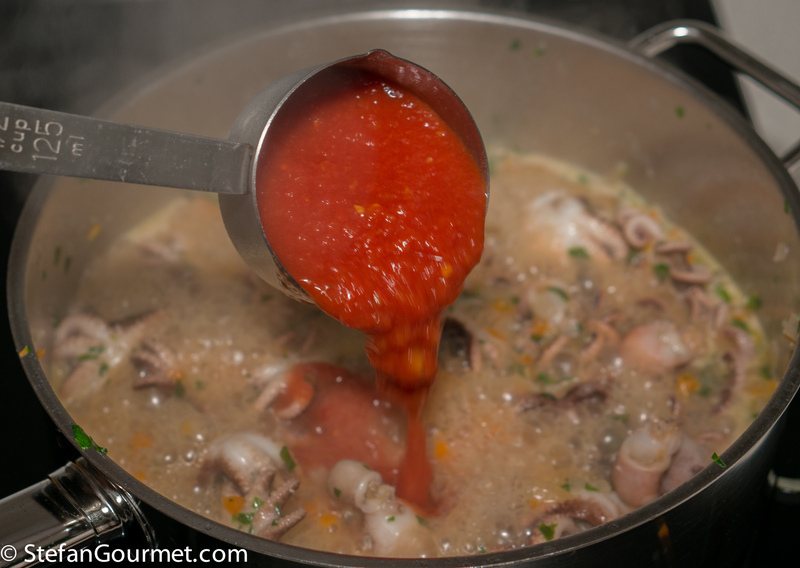 You can encounter baby octopus in a hot red sauce all along the long Italian coastline. “Alla diavola” refers to the use of chilli flakes. You can make it as hot or as mild as you like. If you are fortunate enough to have access to good ripe tomatoes and fresh baby octopus, all the better. 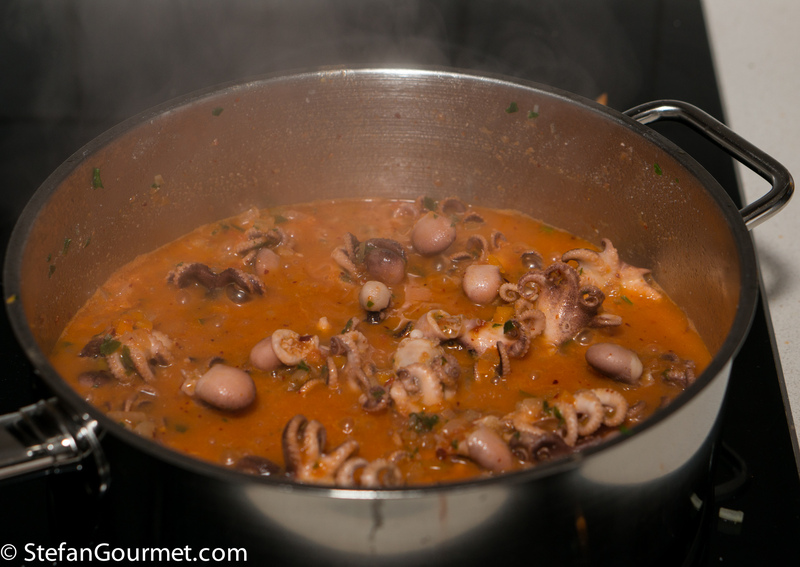 But this is nice enough when using frozen baby octopus and canned peeled tomatoes. 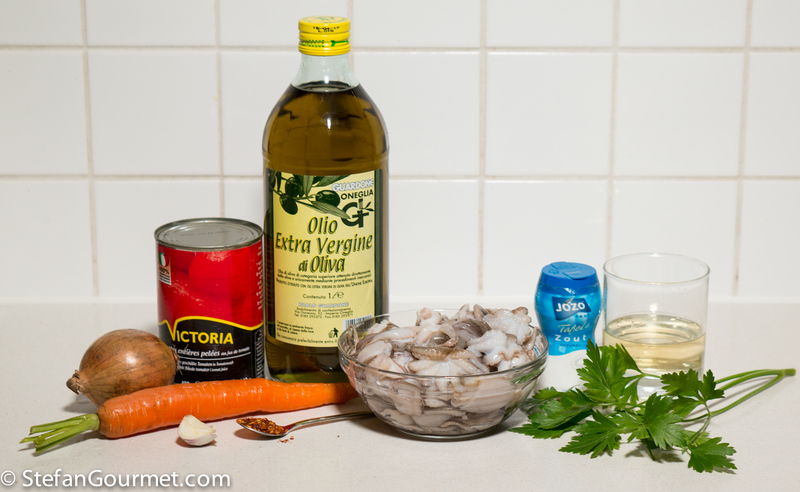 The baby octopus do take a while to become tender, but otherwise this is a simple dish that can be served either as antipasto or as secondo. 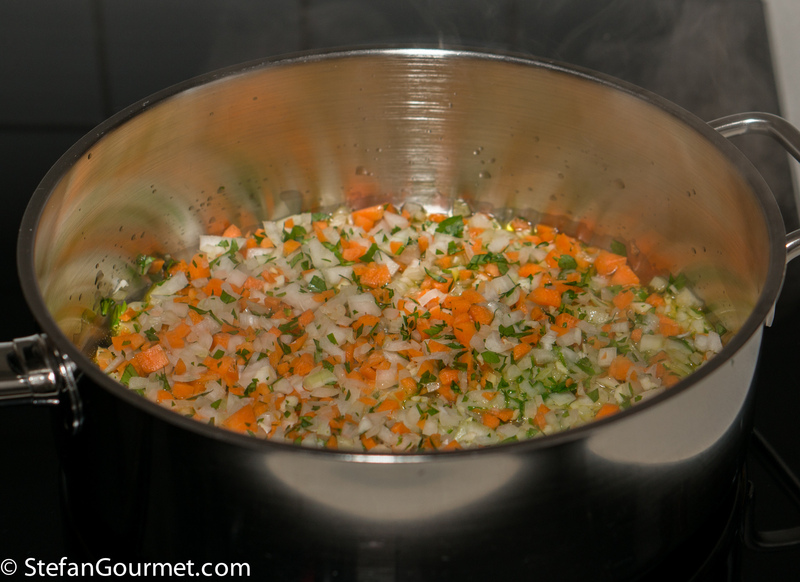 Mince garlic, carrot, onion, and parsley. Heat 2 tablespoons of olive oil in a frying pan. 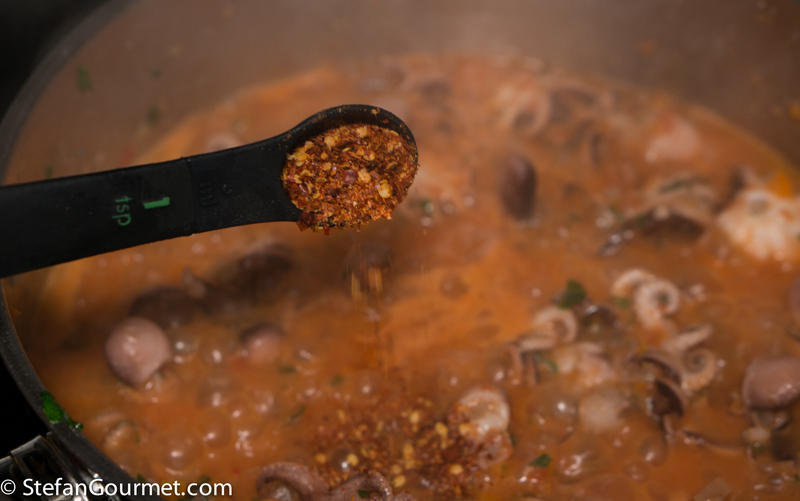 Add the minced vegetables, and stir for a minute over medium heat. 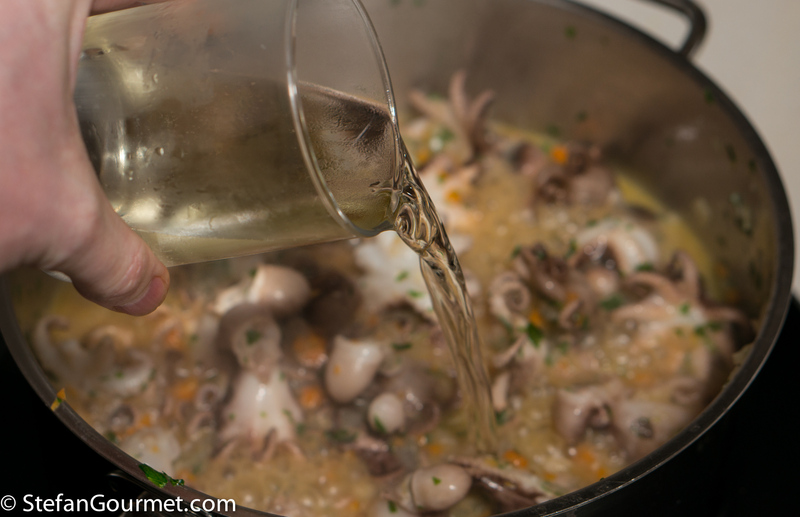 …and stir over high heat until the octopus releases its water. …and chilli flakes to taste. Season with salt and stir. 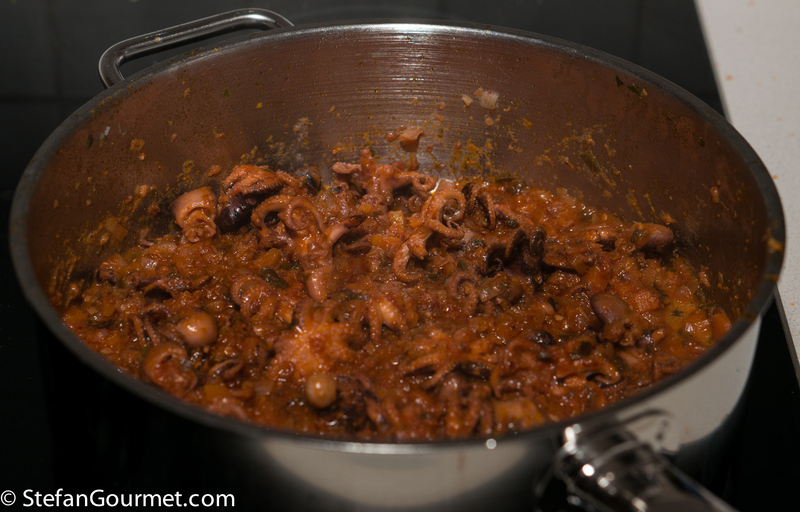 …until the octopus is tender and the sauce has been reduced, about an hour. Taste and adjust the seasoning with salt and chilli flakes. 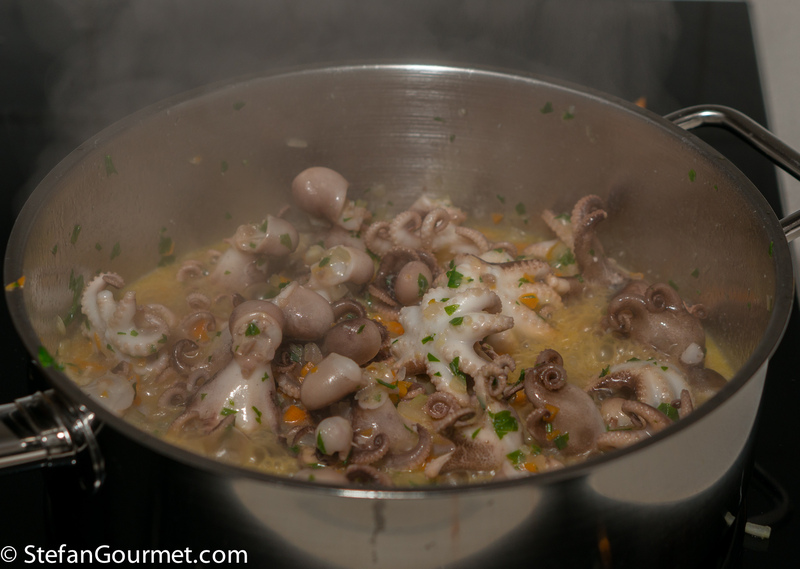 Serve the baby octopus hot, with the sauce (or at room temperature in summer). 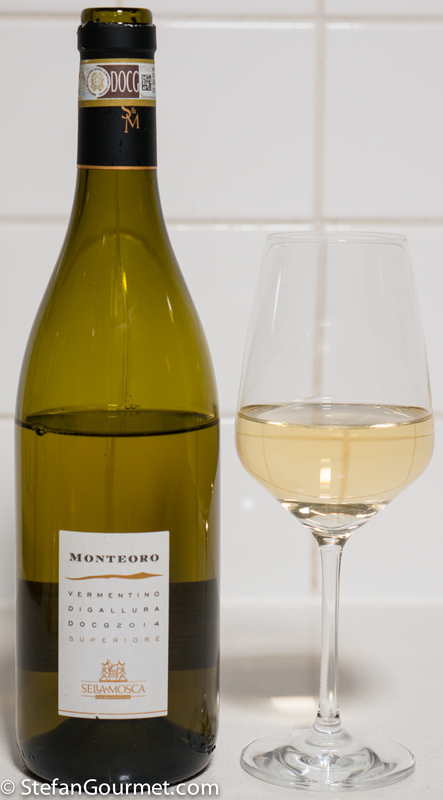 This is excellent with a Vermentino, either from Sardinia or Liguria. 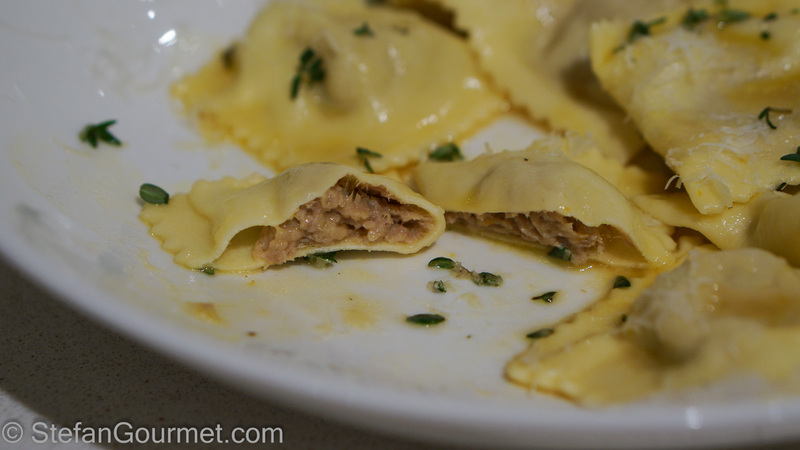 These duck and orange ravioli are just wonderful. Duck and orange are a classic combination, and in these ravioli they come together in elegant pillows of thin pasta. Great! And can get baby octopus at every one of my s’markets, and , sadly, they will probably be frozen! May I humbly suggest the only part of taking this ‘abroad’ are the chili flakes, few at that!! May I humbly and ignorantly suggest I would have cooked it ‘short’ . . . soba . . . udon . . . whatever noodles in attendance . . . 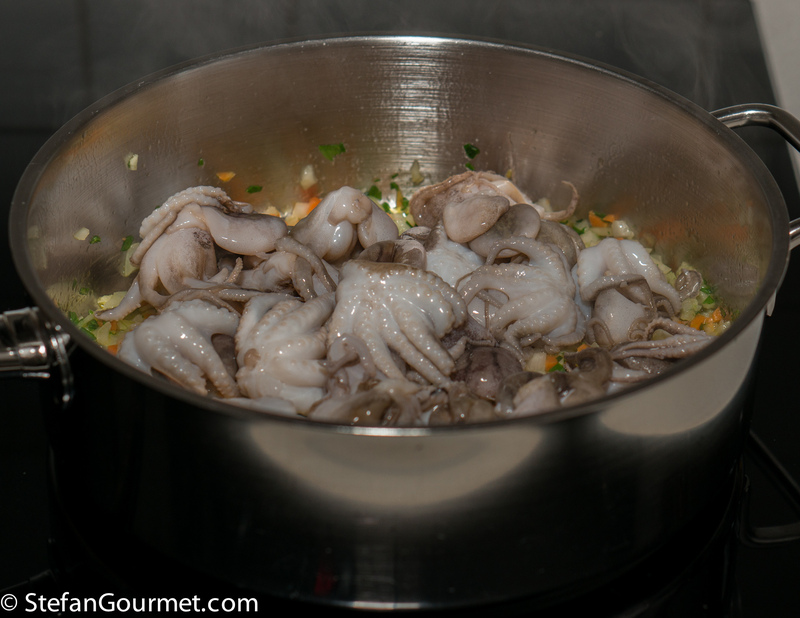 Unlike squid and its relatives, which can be cooked either briefly or for a long time, octopus in my experience always needs long cooking to become tender. Although freezing does help to tenderize them. Agree! BUT, these were nominated as ‘baby’ octopus . . . . the ones I get are less than a man’s ‘thumb’ in size . . . . honestly, about 6-8 would barely make a very reasonably serving 🙂 ! I’ll cook Greek long at any time but these are fun and fast 🙂 ! Wish you were here at the moment: bet I could make Kees and you aficionados of road cycling having the fun I’m having!!! Not sure about the road cycling 🙂 If the baby octopus are really small, an even shorter cooking time would be possible. After a some decade of using huge fun and more of ‘knowledge’ please DO believe that it wonderfully, gorgeously ‘there’ . . . . what a great day . . . . . many fantastic interviews . . . can’t wait until the next . . .
How are they prepared as dim sum? 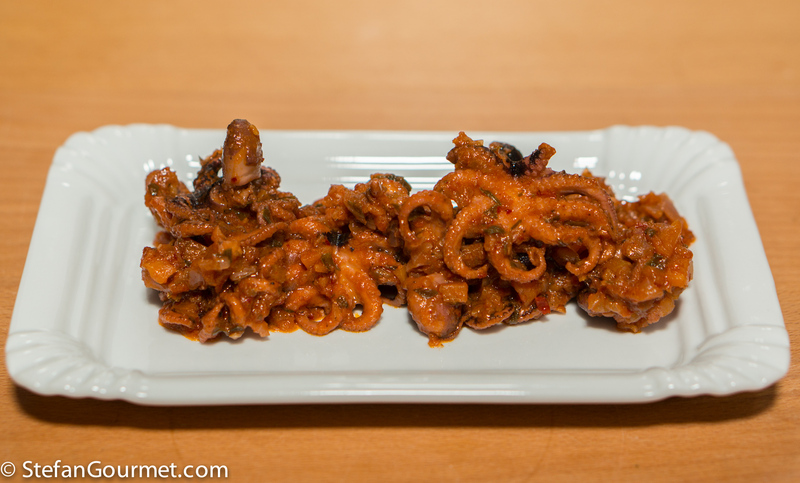 I remember the first time I tried octopus, it was delicate and delicious! We have an excellent Peruvian seafood restaurant here that serves it. I’m not sure if it was baby or not, though. Looks wonderful! Hi Kathryn, I’m sorry but I have to agree with Hans that you should be able to tell if it was baby octopus or not. If you look at the photo, you can see that the tentacles of the baby octopus are tiny. If it is mature octopus, a single tentacle is thicker than the entire baby octopus. So if you can see tiny tentacles, it was baby octopus. If not, it was mature octopus. Then I had a mature octopus, thank you! Thanks, Kathryn. It does have a delicate delicious flavor, and it still works with this not so delicate sauce. I am absolutely, positively in love right now. IN LOVE I tell you! Pinning this delicious recipe! Octopus is DEFINITELY one of my favorite things EVER! I am busy cooking this recipe now.. Unfortunately I added a whole can of crushed tomatoes (400 gr) instead of 125 grams. 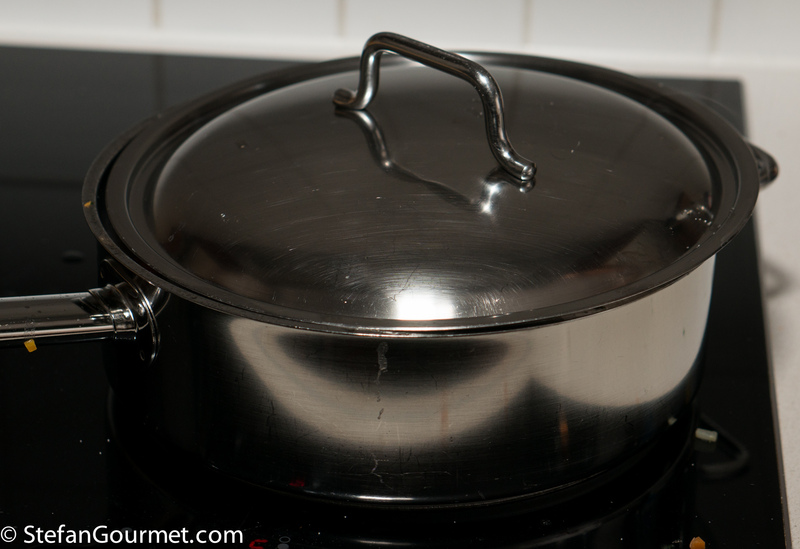 Still looks OK. Will let it simmer without the lid so it will reduce a bit. As I am tasting it, already in LOVE with the recipe. It will be ok, just with a more prominent tomato flavor. Let me know how you liked the end result.